+ Surely it is not the business of the Church to adapt Christ to men, but to adapt men to Christ. 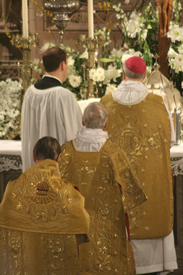 The Mass: Do this . . . .
DO THIS IN REMEMBRANCE OF ME. In loving obedience to the command of the Lord Jesus, the universal Church has — for two millenia — continually celebrated the holy sacrifice of the Mass. Accordingly, gathering for the Mass is the central act of worship at Ascension and Saint Agnes. To learn more about the Mass, its structure, and how we celebrate this great eucharistic liturgy at Ascension and Saint Agnes, follow the links on the right side of your screen. I AM THE FOOD OF THE FULL-GROWN; grow, and thou shalt feed on Me. Nor shalt thou change Me into thy substance as thou changest food to thy flesh, but thou shalt be changed into Mine. Cibus sum grandium; cresce et manducabis Me. Nec tu me in te mutabis sicut cibum carnis tuae, sed tu mutaberis in me. — in St. Augustine of Hippo, Confessions, Book VII, Chapter 10.